The use of this photo does not constitute support of this site by Capital Community News. 9/15/06 Adrian Fenty get asked about Skinner on WTOP even after the huge primary win. I guess this issue refuses to die. 9/10/06 Metro Weekly: Fenty campaign admits Skinner participated in homophobic activities yet deserves a second chance. 8/30/06 A poster on the Cleveland Park list-serve relates a very telling story about Fenty. 8/25/06 The Washington Blade has an article about Skinner. 8/24/06 NBC 4 interviews Councilmember Graham about Skinner. 8/10/06 "Brotherly Love" Cover Story from the Washington City Paper. 7/17/06 Joe Englert's response to Adrian Fenty's radio interviews. 7/17/06 Marc Fisher of the Washington Post has written a very solid piece on the subject. 7/17/06 Someone sent me some ANC 1B meeting notes from when Sinclair Skinner was on the ANC. 7/14/06 Adrian Fenty was the guest on The DC Politics Hour (WAMU) and The Politics Program (WTOP) where he faced harsh questioning regarding Sinclair Skinner. 6/29/06 I received a statement from Joe Englert, the owner of Temperance Hall, detailing more of Sinclair Skinner's divisive ways. 6/27/06 Mark Segraves of WTOP has uncovered another scandal involving Sinclair Skinner. Once again Adrian Fenty is backing him up. 6/01/06 Site mentioned on DCWIRE. 6/01/06 Site was down for a few hours due to a network outage. 5/31/06 Explanation for the site being down. 5/18/06 Brief snippet in the Washington Post. 5/12/06 Despicable attack against my employer. 5/9/06 Mark Plotkin comments on the issue. 5/7/06 Received two statements from concerned citizens. 5/5/06 Received an email chain from my neighbor and Mr. Skinner. 5/5/06 Hitcount for this site reaches over 1000. 5/4/06 Mr. Skinner threatens a law suit. 5/4/06 Personal message from me. 5/4/06 Ballot Box Stuffing in the poll. To convince Council Member Adrian Fenty to remove Sinclair Skinner from his mayoral campaign staff and to publicly promise that Mr. Skinner will not hold any position in his administration if elected Mayor of D.C.
For Adrian Fenty to publicly come out and say that he supports Sinclair Skinner and his actions. Mr. Skinner is a very misguided individual with a proven track record of using divisive measures, including threats and intimidation, to further his agendas. (Read through this site, you be the judge) Mr. Fenty must be made aware that Sinclair Skinner is a loose-cannon who could cause his campaign or his possible mayoral term a huge embarrassment. It is my contention that should Adrian Fenty become mayor, he will appoint Mr. Skinner to a position where he will thwart positive development efforts in D.C. It has become clear to me that the only method of achieving this mission is by convincing Adrian Fenty that he will lose a significant number of votes if he continues to support Mr. Skinner. Mr. Fenty has been made aware of the issues with Sinclair Skinner from several sources, including Council Member Jim Graham, on several occasions, and has chosen to ignore them. Please read through the entire site (sorry it is so long.) If there is just one thing you read, read "The Georgia Avenue Defender" section. If you feel the way I feel then please contact Adrian Fenty and let him know that you will not vote for him unless he cuts ties with Sinclair Skinner. If you could, please CC me on all correspondences with Mr. Fenty, if you feel comfortable doing so. I am just an average D.C. resident with very little interest in D.C. politics. 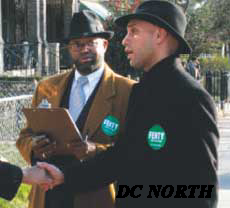 I am not starting this campaign to damage Adrian Fenty or to endorse any of the other candidates in the 2006 Election. I have, and other people I know have, spoken to and emailed Mr. Fenty on several occasions about this issue and he has chosen not to take any meaningful action. Therefore, I feel I have no choice but to do whatever I can to convince Mr. Fenty he made a bad mistake aligning himself with Sinclair Skinner. I am not unsympathetic to the causes that Mr. Skinner fights for. I simply disagree strongly with his methods and his obvious bias. I do not have the answers to these issues, but I know for damn sure Mr. Skinner does not either. The thought of him having the power to decide scares me immensely. The views and opinions posted here are my own (except the Other Testimonials and Responses sections). I do not speak for nor am I being supported by any group, person, or any other entity. Adrian Fenty was the guest on The Politics Program with Mark Plotkin. At the 39th minute Mark Seagraves asked Fenty about Skinner's role in his administration. Mr. Fenty once again dodged the question, but did say that he he thinks there is a way to make progress on this issue. Mr. Fenty has not approached me with any "plan." I would love to hear it Mr. Fenty, you know how to contact me. Now that Fenty has won there is very little leverage that can be used to cause him to address the Sinclair Skinner situation. I hope my fears about what could possibly happen are not realized and that Fenty turns out to be a great mayor. Thank you to everyone who has supported me throughout this process. My work is not done, however, I am on the ballot for ANC SMD 1A08 running against one of Sinclair Skinner's closest friends, Janisha Richardson. I hope the outcome in that race will be more to my satisfaction. If anyone learns any new information about Mr. Skinner, such as what position he is appointed to in the new Fenty administration, please let me know. Feel free to let Mr. Fenty know your concerns on this matter, especially those of you who voted for him despite the Skinner issue. To the press: You are the only ones who can really keep this issue alive. I know several of you are very concerned about this issue, even some of you who endorsed Fenty, and I urge you to not let Fenty off the hook. Click Here to read the entire article from Metro Weekly. The campaign for GLBT votes hasn't been entirely without controversy: Fenty associate Sinclair Skinner was behind an anti-gentrification movement in the 14th and U neighborhood that attacked Ward 1 Councilmember Jim Graham as ''Grahamzilla' ' in a series of posters deemed by many to be both racist and homophobic. Rosenstein says he is satisfied with Fenty's handling of the situation. Re: [Cleveland-Park] Re: Another Adrian Fenty Fiasco? be paying Mr. Skinner's salary. listened to the radio, I would know that he has appologized for them. since Mr. Fenty is bi-racial. That more than concerned me, it offended me. devisive tool, I merely questioned Mr. Fenty's association with Mr. Skinner. That pretty much says it all for me. Click Here to read the Washington Blade Story. Click Here to read Ryan Grim's cover story on the Sinclair Skinner scandal. 2. The UNC was not formed by a group of gentrifiers, it was co-founded by Dr. Adrian Wilson a longtime, black, resident who has served the Park View community as a dentist for many years. The other co-founder was Andrew McGilvray. Anyone who has ever been to a UNC meeting could atest to the fact that there is always a very diverse audience and leadership. 4. In my opinion there were not 10-15 Howard students accompanying Mr. Skinner at a UNC meeting. There were between 3-5 students who attended the meeting with him. I talked with the reporter, Ryan Grim, and he told me he had gotten that figure from other witnesses. I asked Joe Englert, the owner of Temperance Hall, for his comments on what Adrian Fenty said on the radio on 7/14/06. "I thought it was amusing at the time of our discussion with the neighborhood when Skinner had racial hate torrets disease. So much hate and bile popped out of his mouth, I don't know if he ever believed what he was saying or some second, third personality had taken over his body. When he came to my estalishments and saw we ran good businesses, he was absolutely distressed. I have never seen someone so desperate not to have someone in their neighborhood because of skin color. Also, "The neighborhood" that was against us consisted of 5-7 people, 1 being a person of questionable mental faculties and the other, a women whom had moved to the state of Georgia but was allowed to remain a protestant. There certainly was no groundswell of disapproval. By the way, Skinner was allowed to be a protestant even though his business was about a mile from Temperance. Lastly, (and of most concern) he made not-so-veiled threats that he couldn't gaurantee the safety of my employees, myself or my customers if we opened up on Georgia Ave. This is the conduct becoming of a person who could be the right-hand man of the mayor??? If my partners want to do a fundraiser at Temperance, it would be to my great shame and disapproval. " Click Here to see some meeting minutes from ANC 1B. The person who sent this to me underlined and bolded quotes from Sinclair Skinner. I am not going to analyze them, but one thing I noticed is that he likes to use the "Ignorant or Racist" approach as he did in the email to my neighbor Greg. Linked below are the audio links of the two radio programs where Adrian Fenty was the guest. I am working on a rebuttal to Fenty's statements that should be available shortly. Even if all the excuses Fenty gave were in fact true, does it still not show poor judgement on his part? DC Politics Hour (WAMU) : Starting at the 34th and later on the 50th minute. The Politics Program (WTOP): Starting at 28th minute. Joe Englert tells how Sinclair Skinner actually went to his office to try to intimidate him to keep his business, Temperance Hall, out of Georgia Avenue. "Throughout the process of securing the license, Skinner made one outrageous comment after another about race and business and questioned why a white man wanted to do business on Georgia Ave. Several times I was even asked if I was Jewish." A must read. Check out the statement I received from Janet Lugo-Tafur by Clicking Here. If there was any ever doubt in your mind about Sinclair Skinner's motives, this should remove all doubts. Sorry for the downtime. I took the website down, in good faith, to comply with Sinclair Skinner's lawyer's Cease and Desist request. The letter claimed that I had libeled and defamed Mr. Skinner. My lawyer sent a request that they specify each and every instance they claim was libelous or defamatory. Mr. Skinner and his lawyer have failed to respond to my lawyer's request in the ample time afforded them. Therefore, I contend that his claims are baseless and are simply another example of his bullying tactics. As a public figure, Mr. Skinner's rights are severely limited. Mr. Skinner's lawyer, Jeffery Whitney, is listed as a Fenty campaign contributor on page #38 of this official DC Government Document. His law firm, Whitney and Associates, donated $500 to the Fenty campaign. Mr. Whitney is part of a two person Perinatal law firm that specializes in suing for birth defects in infants. I would advise anyone interested in the legal aspects involved in this case to consult this 1st Amendment website. I would like to encourage everyone to join the ACLU, as I have, if you are concerned about 1st Amendment rights. (or any of the other civil liberties they are champions for.) The ACLU has been very helpful to me in this situation and I thank them immensely for their support and guidance. Without such a prestigious organization, I can't imagine where our civil liberties would be at the moment. As an American, it is hard to fathom that I would not be allowed to disseminate important information about a public figure. The Washington Post had a snippet about this website and why it has been down. The article barely scratched the surface of the issue at hand. Hopefully there will be a much more, in depth article written. Click Here to read the article. I have received a new testimonial from one of Sinclair Skinner's neighbors, Beth. She has told me that when reading my website she felt like she was reading her own story. Her testimonial is very powerful and exposes Mr. Skinner and Mr. Fenty for who they really are. Click Here to read Beth's Testimonial. On Friday May 12th, someone going by the name "Gary Rahman" decided to send a nasty email to the company I work for. He CC'd the message to many of the senior members of my company in an attempt to get me fired. The email claimed that their employee (me) was using their computer systems for illegal activities and for smearing a city Councilmember. It also claimed that I was spreading fictitious lies about one of the Councilmember's staff members. The email stated that since this activity had taken place from their computer systems, the company could be held liable and taken to court. I was petrified when I heard the news. I had never met or even heard of most of these senior members of my company. I spoke to the legal department and they seem ok with the matter. In the end I received a lot of support from my company and the situation backfired on whoever perpetrated this cowardly act. I would suggest not trying that tactic again as I have a feeling they might get the FBI or some other entity involved. The interesting thing about the email is that as part of Mr. Rahman's "evidence" was an email I had sent to the Washington City Paper from my work email account. I have contacted the reporter at the City Paper and he has told me that he did indeed forward my email to one person. He says that he contacted that person and they deny sharing it with anyone. The reporter told me he was unable to tell me who he forwarded the email to since that individual was a "source." I told the reporter that his "source" was lying and must have shared the email. I do not hold the City Paper responsible since the material in the email was simply a cut-and-paste from this site. It was my fault for using my companies email system. At the same time I don't understand why the City Paper can not tell me who they forwarded my email to. I don't understand how that is protecting a source. I understand some people may feel that this act is justified, but it is not. It was a desperate act and shows the levels that the other side is willing to stoop to in order to silence my 1st Amendment rights. I sincerely hope this "Gary Rahman" acted on his own as an over zealous supporter and did not obtain the information from the Fenty campaign. I noticed that there is a Gary Rahman listed as a Fenty campaign contributor on page #17 of this Official DC Government Document. Mr. Rahman and his wife both donated $500 each to the Fenty Campaign. I submitted a question to Mark Plotkin on the Washington Post's live discussion today and received a very interesting response. Take a look. Washington, D.C.: I am the creator of the dumpskinner.com Web site. I was wondering if you have spoken to Adrian Fenty and asked him why he continues to employ this divisive individual, Sinclair Skinner? The facts speak for themselves. I have recieved hundreds of emails and even heard that members of Fenty's own staff are questioning his judgment on this. People have told me they have removed their Fenty yard signs and demanded answers from him that have gone unanswered. Do you think this scandal could possibly cause Fenty to lose the election? Mark Plotkin: This Skinner situation ... I can't get a handle on this. Somebody just described him as his former fraternity brother. Fenty told me that he's looked into the concerns and doesn't see anything wrong and I keep on getting questions about him every week. I'll call Fenty again and ask about it but I don't think he's changing his mind. I have received a statement from a Columbia Heights resident that backs up my telling of what happened at Mr. Skinner's "Press" conference. Click Here to see the statement. I have added a new section of the website called "Responses." This section includes various responses I have received thus far about this issue. Please take a look by clicking on the tab at the top of the page. I was sent a statement that once again provides more evidence that Mr. Skinner had full knowledge of the content in the "Georgia Avenue Defender." Click Here to see the statement. Sinclair Skinner Apologizes by misleading the public yet again. The email from Greg, along with all the other facts, clearly shows he had knowledge of the content of the Defender and actively supported it. Do he and Fenty really believe the public is that gullible? I am writing to you to apologize personally about the controversy arising from the Georgia Avenue Defender. Although the Defender was a publication of The Lower Georgia Avenue Business Association and I was the President of the Association at the time of its dissemination, I did not have an editorial role in the publication. As President, I take full responsibility and I apologize for the subject matter. Shortly after the June 3rd, 2005 publication, I disassociated myself from the Defender and thereafter no further issues of the Defender were published. More evidence about Sinclair Skinner and the "GA Defender." "The other night on the phone, Mr. Fenty assured me that Mr. Skinner told him that he was not involved with the 'Georgia Avenue Defender.'" "the issues brought out in the defender may bother you but, remember everyone has a different perspective. if you are willing to learn about the Black community the defender will enlighten you, if you refuse to learn, you will probably dislike the upcoming issues even more." More details and the full content of the e-mails are available here. The hitcount has reached over 1000 hits!!!! It is even more impressive, because that is an undercount. The counter is setup to only record unique IPs. Since many places are behind a firewall, such as DC.gov, anyone coming from there will only count as 1 hit. "My name is Sinclair Skinner, and recently, an individual sent untrue and slanderous information about me to this ListServ, and used the information to create a Website to try to destroy my name and career. Because of the viciousness and harmfulness of the attack, I have had no choice but to hire an attorney to bring charges against this individual. There is little additional information that I can provide personally until the lawsuit has run its course, however, I just want to reiterate that the information that was posted is not based in truth and that will be proved in court. The response to this site has been so overwhelming. I appreciate all the massively positive support I've received thus far. Keep up the effort, get the word out to everyone you know and to the press who have been dragging their heals on this issue. Look, as I said I am a Computer Science major and I don't run this site on a Diebold machine. Do you not think I would notice if you guys stuff the ballot? There is something called a log file, and when I notice multiple votes in a short amount of time all originating from one IP address I'm going to delete the multiple votes. Bottom line is if you see vote totals go down it is because there was ballot stuffing going on.